All of our coats are Canadian made and feature an “Easy On, Easy Off” design. 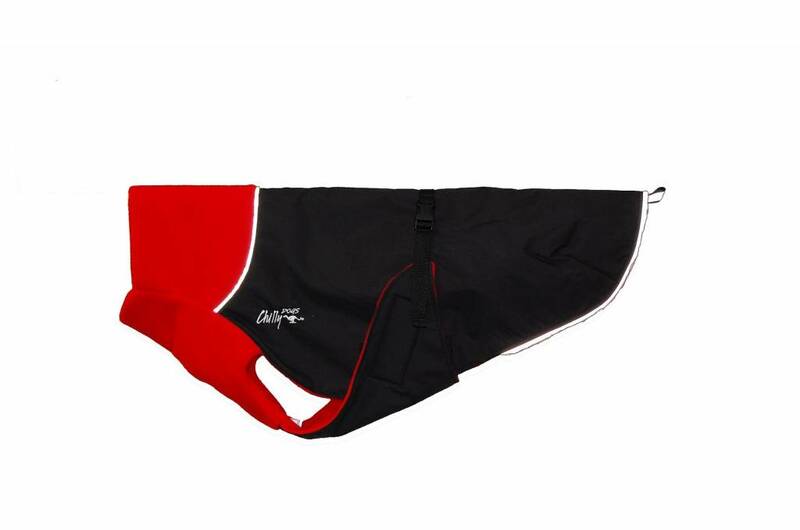 The coat is simply slipped over the dog’s head, then the “Y” shaped belly panel is pulled down and back between the front legs, then pulled up over the dog’s back where the buckles are fastened and the webbing is adjusted. Canada: Skillfully designed and manufactured in Canada. Denier: 100% Waterproof polyurethane coated outer-shell. Not PVC nylon. Breathable, durable and machine washable. Fleece: 12oz Canadian made, non-pilling fleece. Breathable, durable and machine washable. Scotchlite: Reflective 3M Scotchlite® piping accents for night visibility and safety. Webbing & Buckle: Adjustable nylon webbing and a smooth shaped buckle system. Hook & Loop: Used to fasten the wide belly panel to the body of the coat. This ensures a secure and adjustable fit. Quick to fasten/adjust. Loop: Hanging loop for storage purposes. This loop is not for the tail!